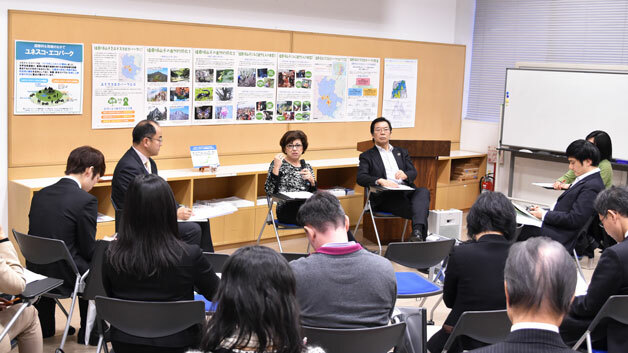 On 8 February 2017, UNU-IAS and Global Environmental Outreach Center (GEOC) organized a conversation with Monique Barbut, Executive Secretary of the United Nations Convention to Combat Desertification (UNCCD). Following opening remarks by Kazuhiko Takemoto, Director of UNU-IAS, and Masanori Kobayashi, a fellow at Yokohama National University, Barbut gave a talk on measures to combat desertification through international cooperation and the latest activities of UNCCD. Barbut pointed out that desertification is not just a matter of dry land in remote places but is a global issue. She pointed out that countries like Japan will be greatly affected by land degradation and desertification due to dependency on imported food and stressed a need for Japan to take measures to meet Global Goal 15. She also highlighted that, in order to achieve a sustainable society, it is crucial to extend support for the people living in dryland areas as desertification often causes increasing migration. She suggested that since addressing desertification requires more labour than technology, a lack of interest from the private sector is a major challenge. At the end of her talk, participants discussed how citizens, in particular youth, can get involved in measures to combat desertification. Barbut summarized that citizens can consider taking measures for desertification by collectively addressing issues of climate change, forests, and agriculture. Finally, she encouraged youth and civil society to promote the issues through SNS and actively participate in the thirteenth session of the UNCCD Conference of the Parties (COP 13) to be held in September 2017.